Today I harvested the drops of sunshine from the garden--Sungold Tomatoes. The few I ate right off the vine were bursting with flavor and I couldn't wait to cook them up into a kind of fresh tomato sauce to serve with the delicious pappardelle pasta I had on hand. Dinner was quick and simple. While the pasta cooked I sauteed the tomatoes with garlic and olive oil in a skillet until they softened. Then using my trusty pasta claw, I just lifted the pasta out of the pot and added it to the skillet. A pinch of sea salt, a few turns of the pepper mill and a good toss to mix, and I was good to go. 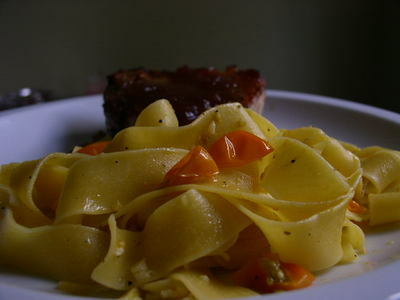 The tomatoes and pasta shared the spotlight with some tasty pork chops from McDonald Family Farm. These were quick and easy too: they were seasoned with salt and pepper and seared on both sides for few minutes in a cast iron pan then moved to the oven (350 degrees). I added a teaspoon of red onion confit on top and, let them cook for 20 minutes before turning. I added a little more confit before another 7 minutes of cooking. When they came out they were juicy and tender, with a touch of sweetness. Not a bad way to start the weekend.